Name Description Mold material: P20ï¼ŒSKD61ï¼Œ718Hï¼Œ2344ï¼Œ45#ï¼Œ60#ï¼Œ2738 ect. , Customers can require Cavity: Single or multi Runner: Hot/cold Design software: UG,CAD ect. Plastic material: PVC,PP,ABS ect. 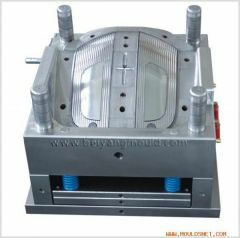 Mold life: (300,000------1,000,000shots) Delivery time: 45-90days Specification: Depends on customers requirements Steps 1.Negotiations: Quality,material,price,payment,delivery time item and so on. 2.Place an order: According customers drawing or sample. 3.R&D: According customers requirement design or improve 3D modeling. 4.Design Confirmation: We send 3D drawing to customer to confirm. Before we make the mold. 5.Mold Processing: CNC EDM machine processing then assembly and trial. 6.Sample confirm: We will send trial sample to customers.Before shipment,If the sample isnâ€™t satisfied customers.We will modify mold until customers satisfaction. 7.Mass production: If customers need mass production plastic products,We can offer. 8.Delivery: Delivery molds by sea or air based on customer needs.